FEATURE – For many couples, the desire to grow a family is as natural as breathing. But the disease of infertility sometimes creates barriers in the natural path to parenthood, which can be a difficult road to travel. The team at the Utah Fertility Center, led by medical director Dr. Russell Foulk, understands the array of challenges associated with infertility and is dedicated to helping couples overcome them. An obstacle that Southern Utah patients experienced was the need for traveling to see a fertility specialist for their ongoing care. The Utah Fertility Center recognized that need and established a St. George location two years ago. Now, the Utah Fertility Center is the first and only fertility center to bring in-vitro fertilization services to Southern Utah. Though only a small percentage of local patients need IVF, Foulk and his team felt it was important to offer a full comprehensive care program. “Our ultimate goal and best reward is seeing our patients achieve pregnancy,” Foulk said. There are many stages making up the complex process of IVF: Initial evaluation, ovulation stimulation, oocyte retrieval, laboratory, embryo transfer, luteal phase monitoring and implantation. Evaluation: A full evaluation confirms the need for IVF and prepares for the cycle, which includes extensive patient education and a few diagnostic tests. This preparation may take a couple months. Ovulation stimulation: Beginning with the onset of a woman’s menstrual cycle, two hormonal medications are given, one to control when a woman will ovulate and the other to stimulate the production of eggs. These daily hormonal injections occur over 10-12 days. Transvaginal ultrasounds are performed to assess the growth and maturity of the follicles containing the eggs. Once mature (ready to ovulate,) a third hormone is given to trigger the eggs’ release (ovulation.) This is usually a 10-day process. Oocyte retrieval: An hour prior to the eggs releasing from the ovary, they are aspirated through a needle into a test tube. Anesthesia allows for no pain, while the transvaginal ultrasound guides the needle into the separate follicles to aspirate the eggs. An average egg yield is about 15, but varies widely. Once the patient awakes from her sleep, she only feels the sensation of ovulation. 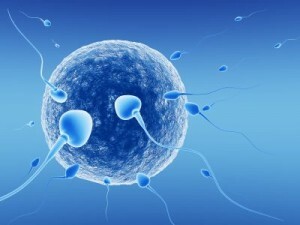 Laboratory: The eggs are mixed or injected with the man’s sperm. The lab is equipped with state-of-the-art instruments, microscopes, incubators, airflow hoods and room filters to ensure the highest quality outcome. Typically, 60-70 percent of eggs retrieved will become fertilized (the same as via natural process.) These fertilized eggs are incubated over three to five days until ready to enter the uterus. Embryo transfer: Three to five days after the egg retrieval, following evaluation of the quality of the developing embryos, a decision is made by the patients and the physician as to how many to transfer to the uterus. Your doctor will discuss the number of embryos to transfer that will provide the highest probability of the success of a healthy pregnancy, while still trying to minimize the probability of a high-order multiple pregnancy. You will receive information on your embryos and a picture of your embryos. Usually, patients decide to transfer one to three embryos. In an atraumatic catheter, embryos are transferred through the cervix into the uterus under ultrasound guidance. The procedure is pain-free. It is often a very reassuring experience to see the embryos placed into the womb. Spare embryos can be cryopreserved on this day and stored for future attempts. Luteal phase monitoring: The patient takes progesterone daily while waiting for the pregnancy test. 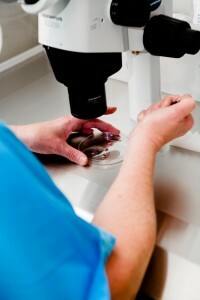 We typically wait 10 days after the embryo transfer to determine whether an embryo implanted. Once it takes hold, the hormone it produces is detected in the mother’s blood stream. This confirms an early pregnancy. Implantation: Successful implantation marks the beginning of a nine-month gestation. The mother-to-be will return to her personal physician at nine weeks gestation for prenatal care. If an embryo did not implant, the patient can use the frozen embryos or begin a new treatment cycle. Katie and Darren, a married couple from Santa Clara, are familiar with the stressful rollercoaster ride of infertility. “We married a little later in life and still very much wanted children and a family. After a few months of trying, we started to do some testing, as I knew I had some conditions that could make it difficult to get pregnant,” Katie said. A nurse-midwife at a busy OB/GYN practice in St. George, Katie soon met Foulk, as her practice had referred some of their patients to the Utah Fertility Center. “I started to ask him some questions and realized we needed to take different measures to have a baby,” she said. For Katie and Darren, the road has not been easy, but it has been worth it. They only had to make a few trips up north, and the rest of their care was available locally. Written by Dr. Russell Foulk for St. George Health and Wellness magazine and St. George News. The medical director of the Utah Fertility Center, Foulk is excited to be the only specialist offering IVF in Southern Utah. He is an internationally acclaimed infertility expert listed among the “Top 25 Fertility Specialists in the United States.” He sees patients and performs IVF at the St. George Surgical Center, located at 676 South Bluff Street, Suite 206 in St. George. For appointments and more information, call 801-785-5100 or visit www.utahfertility.com today.